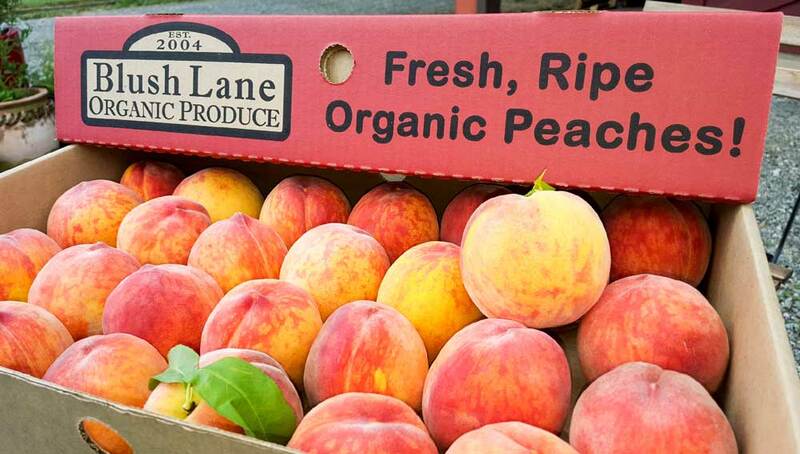 At Blush Lane Organic Orchard, we grow over 10 varieties of peach trees that are harvested from July to September. All are tree ripened before we pick and pack. This means there are juicy, fresh and flavourful peaches available throughout the summer at our markets. The first varieties of peaches harvested are clingstone varieties. In these varieties, the flesh tends to cling to the pit. Later season peach varieties are freestone, so their flesh comes right off the pit. We have begun harvesting our first freestone peaches, which will continue until September. Each variety has slight variations in skin and flesh colour as well as density and flavour. Red Havens, Harbrites and GloHavens will be shipped over the next few weeks. To get the latest and tastiest peaches, visit our stores in Aspen Woods (Calgary) or Whyte Ave. (Edmonton), or at the Calgary Farmers’ Market or orchard in Keremeos, BC. previous post: How about them summer apples?